I have a friend that alternates reading through the Bible one year, and reading through only the Psalms the opposite year. I love reading the Psalms as it is just a taste of what the Psalmist, in this case David, was thinking. Just a little background so we can understand what is going on here and the circumstances in which David is writing. Most believe this Psalm was written by David after he fled from his very ungrateful son Absalom who was trying to take over his thrown and crown. Fleeing for his life, David has nothing to do but turn to God and confess the faith he still has in him. He’s basically saying, look Lord, I know most people hold up a sword to protect their bodies, but I believe you will be that shield, that you are the one that is here to protect me. And not only is the Lord my protector, but from that same verse he is my STRENGTH. I am not the one that can even hold my head up, David is saying. 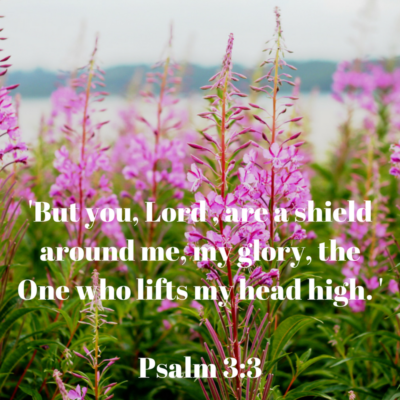 I am weary from the running from the fight, but YOU, Lord, are the One who lifts my head HIGH. Its not enough that God just lifts his head up, but GOD LIFTS HIS HEAD HIGH! How is your faith this morning? Are you ready to sing a prayer and believe like David, that in the face of whatever it is that may come against you, no matter how weary you are from the fight, the Lord, will be your protector and your strength?